So I posted my Classic Cottage Pie recipe yesterday (you can view that post here), and it reminded me of a lightweight version of this dish I cooked a month or so ago. This recipe came from the 5:2 diet book, ‘The Fast Diet Recipe Book‘, and it’s a lower calorie version of the classic. The main way this Cottage Pie sheds calories is by switching out the usual potato mash topping with a lighter version of celeriac and leeks, which I thought sounded interesting. And it was! I didn’t really have massive expectations about this dish before cooking it, but it really did impress me when it got to the eating part! So much so that I would happily eat this version instead of the full Classic Cottage Pie if I was in the right mood! The topping was a really nice replacement for the potato (and that’s pretty impressive from me given that I bloody love a potato), and the meat was full of flavour. So, this recipe is tasty AND virtuous. Good stuff! PS. 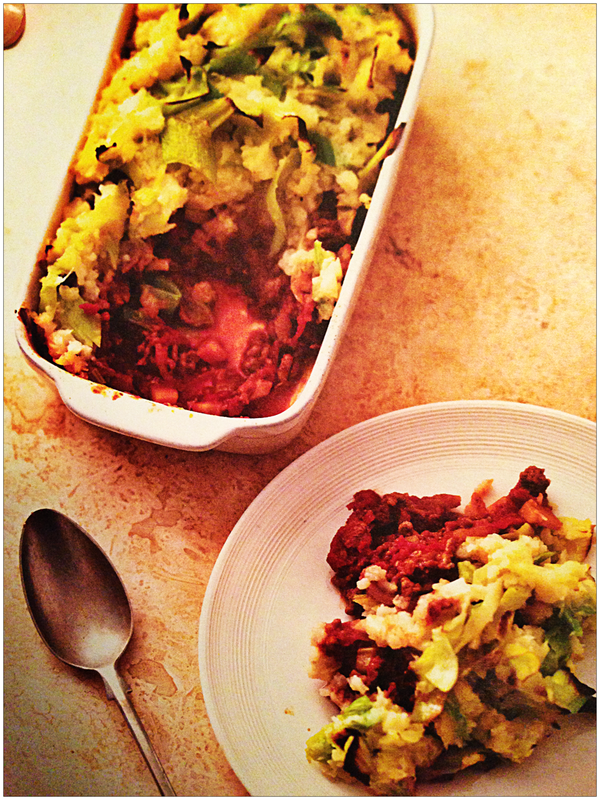 I apologise for the fact that I don’t have a proper photo of the cottage pie – I forgot to take one, so this is a photo from the book! KB rating 8/10. PR rating 8/10. Spray a large pan with oil and brown the minced beef. Add the diced onion, celery and carrot and allow to soften for 10 minutes. Stir in the chopped tomatoes, tomato puree, Worcestershire sauce, bay leaf, thyme, salt and pepper, water and OXO cubes. Bring to the boil, cover and simmer for 30 minutes, stirring occasionally. Meanwhile, boil the celeriac until very tender, drain and mash with creme fraiche until as smooth as as you wish. Heat the oil in a pan and gently saute the leeks, then add them to the celeriac mash; season well. Categories: 5:2 Recipes, Cow, Reidbury Recipes | Tags: 5:2 diet, autumn, beef mince, Fast Diet Recipe Book, pie, winter | Permalink. When my boyfriend was little he used to love what he called ‘yellow fish’ – smoked haddock. So when I was looking for a suitable 5:2 starve day recipe my eye was immediately drawn to Smoked Haddock with Spinach and Poached Egg in The Fast Diet Recipe Book (buy the book here). It’s all classic flavours, very comforting and super quick to make. And it’s very low calorie too – bonus! Not much else to say – other than, good luck on poaching eggs. Unless I use my silicone poaching pods, I cannot poach an egg. There, I’ve said it. KB rating 7/10. PR rating 7/10. Wilt the spinach leaves in a little salted boiling water and drain well. Stir in a pinch of nutmeg and season. Poach the fish for 10 minutes in milk (or microwave for 3 minutes in a covered dish). Meanwhile poach the egg. 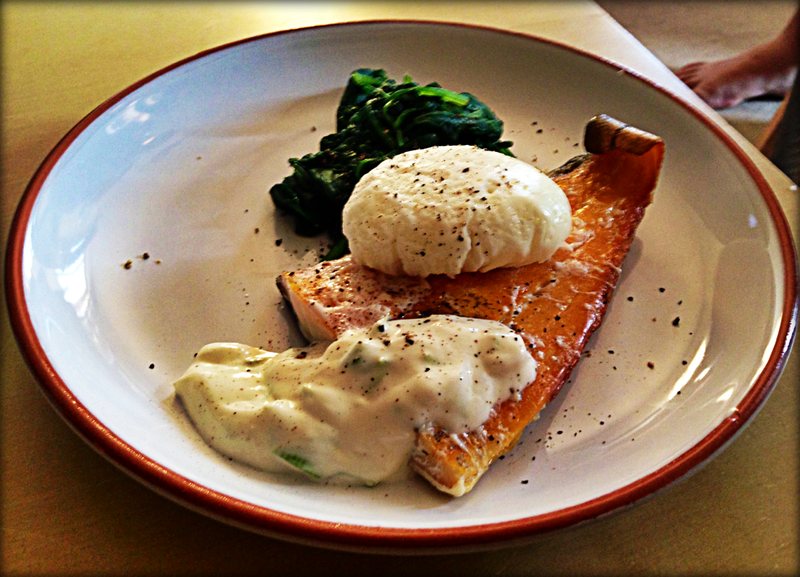 Serve the fish and spinach topped with egg and creme fraiche mixed with spring onion and a squeeze of lemon. Categories: 5:2 Recipes, Fish, Reidbury Recipes | Tags: 5:2 diet, eggs, Fast Diet Recipe Book, fish, smoked haddock | Permalink. Another starve day, another recipe from The Fast Diet Recipe book. And the more recipes I try from this book (available to buy here), the more impressed I am. And thankfully the 5:2 diet is starting to show results now – not really on the scales, but definitely on my waist line. I found some old jeans last week that I put on in a rush that fit perfectly – and all day I actually thought they were my ‘fat’ jeans. Turns out they are the ones I bought when I lost weight last year and have been a little snug since…until now! So there you are, a little ‘win’ in the Reidbury Kitchen! So the recipe is Lo Lo Meatballs with Cavolo Nero and all I can comment on is the end taste…because, for once, I didn’t cook. The boy did! And he did so without causing himself, or anyone else, any damage which suggests that the recipe was relatively straightforward. Anyway, the taste – oooooh it was good! 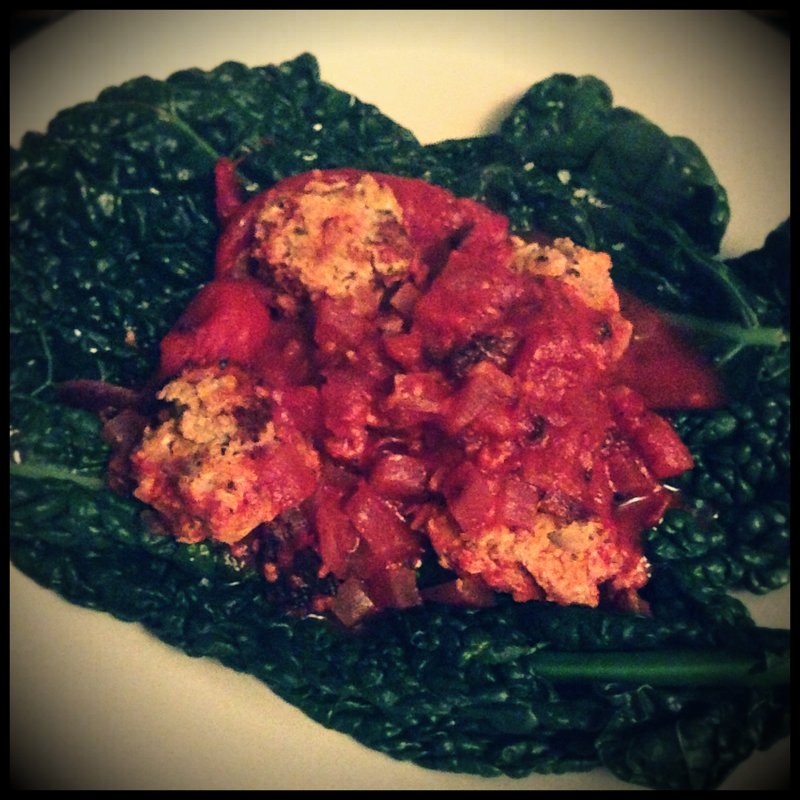 There’s something about meatballs that feels like a treat, and not diet food anyway. But this recipe was full of flavour and really didn’t feel like a skinny option in any way. And I didn’t even miss the carbs – the cavolo nero was hearty enough that it worked nicely as a substitute. I would definitely recommend using cavolo nero if you can find it (rather than another cabbagey type thing) because the texture and flavour are both quite robust and blend well with the sauce. But if you cant get it, then cabbage or kale would work OK.
I’m actually planning on doing this recipe again – even if it’s not a starve day! Place the mince in the bowl with the onion, garlic, carrot, oregano, egg and salt and pepper. Mix well and shape into 12 small meatballs. Spray a large pan with oil and fry over a medium heat until gently browned (around 4 mins) and set aside. For the sauce, spray the same pan with oil and fry the onion until softened. Add the garlic and cook for a further 3 minutes. Then add the tomatoes (tinned and fresh), puree, sugar and water along with the chilli flakes and Worcestershire sauce to taste. Simmer til reduced and glossy. Add the meatballs and oregano, cover and simmer for 20 minutes. Serve with the steamed cavolo nero, dressed with a light squeeze of lemon and a scatter of flaked sea salt. Categories: 5:2 Recipes, Pig, Reidbury Recipes | Tags: 5:2 diet, autumn, Fast Diet Recipe Book, Meatballs, winter | Permalink. So as you will probably know by now, I’ve been half-doing WeightWatchers for a while and lost half a stone. But since my trips away to Spain, New York and Scotland, I got firmly out of the habit of point counting. And now I can’t be bothered with it. Meanwhile Paul has been on the 5:2 (or Intermittent Fasting) diet for about 3-4 months and has lost over a stone. So I decided to convert. And I think I must be the only person who seems to have put weight on doing this. It’s only my third week though, so hopefully my body will catch up soon! One of the first recipes I tried was Lime Chicken Salad, Szechuan Style and it was excellent. It actually ends up being quite a plateful, so psychologically I felt like I was getting a good deal. Lots of flavour, and only 195 calories. Definitely a dish I’ll do again, on both my fast days AND my feast days! Finally this recipe requires Szechuan pepper, and it’s a pretty key component. But Waitrose let me down and were out of stock. Instead I bought Wayanad pepper which sounded interesting – “intensely spicy with a slight citrus flavour” – and I thought it’d work well. It did, but I would like to try this again with Szechuan peppercorns should I find them. Oil the chicken breast lightly before seasoning with salt and pepper (skin to be removed after cooking). Bake, covered, in oven until cooked through and juices run clear – about 20 mins. Allow to cool. 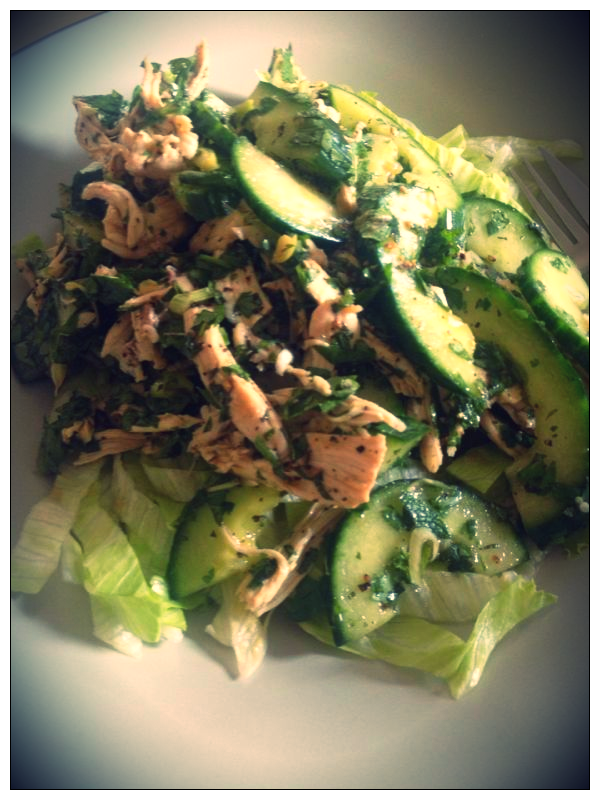 Tear chicken into shreds and place into a bowl with cucumber, most of the coriander and mint. Make the dressing from the Szechuan pepper, fish sauce, sesame oil, spring onion, lime juice and seasoning. Combine with chicken mixture and serve on shredded iceberg lettuce. Garnish with lime wedges and remaining coriander leaves. Categories: 5:2 Recipes, Chicken, Reidbury Recipes | Tags: 5:2 diet, Chicken, Fast Diet Recipe Book, spring, summer | Permalink.